Happy All Hallow’s Eve to everyone! Well, it’s Halloween, and I have some nifty yet sobering Halloween themed cartoons I planned to present today. They provide some commentary on our economy, and weigh in on what’s the latest in finance and politics. Mildly amusing but kind of gloomy. I came across this poignant cartoon on the Active Rain real estate network. It’s dark humor, I suppose, and marks the climate and mood we’re living in. To many communities, these images hit close to home. The foreclosure map below of the general area where I live literally illustrates which areas are hit the hardest around my neighborhood. 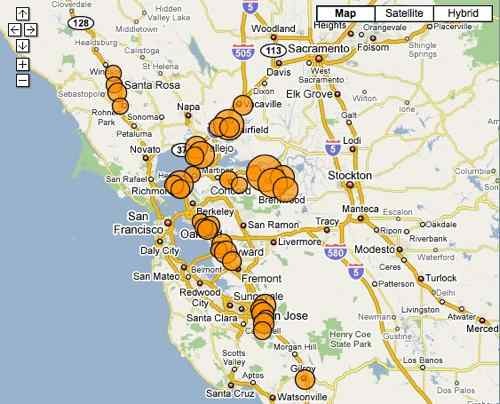 Here are some details on San Francisco Bay Area foreclosures. As the adage goes: the higher they fly, the harder they fall, and it certainly rings so terribly true for our home prices. The thing is, many citizens are simply wishing to return to those halcyon days when the biggest dilemma on Halloween was to figure out whether they should stay home and man the candy stash (since leaving the bowl of candy outside makes it vulnerable to candy hoarders) or decide to tour the neighborhood with everyone. These days, many families have a lot of other things on their mind. Whatever the case, I hope you find a little reprieve during this kid’s holiday and are able to engage in some Halloween fun as a short distraction from reality. Be safe on the streets. And may all that candy (or partying) help us forget our troubles for the moment. Created October 31, 2008. Updated October 31, 2010. Copyright © 2010 The Digerati Life. All Rights Reserved. I agree, foreclosures have been up this year and it’s only going to get worse, I think. Hang in there folks! Well Halloween is over and it turned out quieter for us this year than it usually is. So we have a lot of leftover candy! I’d rather not give my kids cavities and I’d prefer not to indulge my sweet tooth (and gain pounds) so how else to deal with the excess? I found a few great articles that address this matter. Take a look at “10 Things To Do With All That Halloween Candy” or this article with a similar title. The Milky Way Pain Au Chocolat sounds good! Our block is actually pretty dark and higher up into the woods so it could be a bit too “rural” for the family crowd. We used to have tons of kids come by when one of our neighbors had school-aged children bring in their buddies. I think those kids are now older and no longer trick or treat so yeah, we’re down 50% of visitors compared to last year! Happy Halloween! Hope everything gets brighter! I’m starting to cringe as I await the next shoe to drop around here. My family wonders how much we’ll be affected by the slowdown as our livelihoods are tied to the economic situation. As you can see, as a full-time blogger (and one who does other web projects), my income is tied to advertising. My spouse is in retail, so his income is similarly affected (although he says it’s not that noticeable yet) and my bro-in-law is in private equity, which I imagine is an area where we’ll see some effects as well. It’s going to be an interesting ride this next year! Halloween was very quiet in our east Los Gatos neighborhood this year – just 30 little trick or treaters came by. Normally it’s about 40 or 50. For a Friday night, I expected more (despite the few raindrops). As for the foreclosures, I don’t think we’ll be done with them for awhile, unfortunately. What funny yet scary images! Thanks for sharing. LOL. This is unfortunately a funny & all to real situation that California is facing. 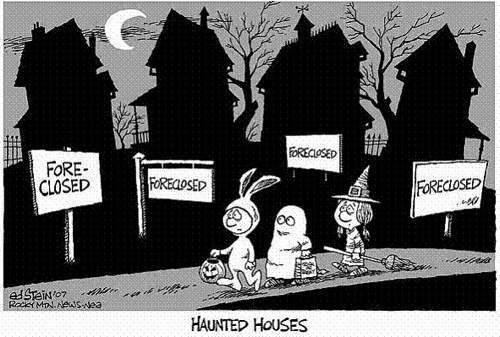 Wow, never thought of halloween this way, with all the foreclosed homes. Just imagine what it’ll be like next year! I would have to agree with this article. Every neighborhood you go into, there is a home that is that has been foreclosed on. It is really sad. What ever happened to the Obama Plan to keep people in their homes. It is scary when you look at the numbers. But, people can prevent a foreclosure by getting educated about the process and facing the problem head -on. Don’t simply allow the banks to run their process…you will lose.